Info on Eugenes Global Marijuana March as well as any related Items. Click > here < for more events. WHAT: 10th Annual Global Marijuana March in coordination with "Medical Marijuana Awareness Week" in Eugene. WHERE: The old Federal Building, 7th & Pearl. WHEN: Saturday, May 2, 2009, the event began at high noon. The speakers were available to the press at 11:30. Assemble 11am at the Federal Building, 7th & Pearl. On Saturday May 2nd, in Eugene, Oregon, USA, we will be celebrating the Global Marijuana March with festivities the entire day. We will start gathering at 11am, with the Rally beginning at High Noon. Speakers include, Elvy Musikka; Dr. Arthur Livermore; Allan Erickson; Edward 'Nurse Ed' Glick; Shawn Flury; Jen Valley; Barry Stull; and our own Dan Koozer as MC. Please bring all of the available MJ & MMJ rally signs that you can. Then there is the After Party and Fundraiser, 8PM, 687 River Ave., Eugene, to celebrate our success and plan next years action. OMMP CardHolders NOTE: There will be a place for patients to medicate. Elvy Musikka is one of the four surviving recipients of US Government grown marijuana, under the Compassionate Investigational New Drug (IND) program. She receives 300 joints a month from uncle sam for glaucoma, which translates to 12 a day on the average. She has been receiving her government-issued supply since October 1988 and is the first woman to get it. “In late February 1975 I went to see Dr. Rosenfeld, a general practitioner in the Ft. Lauderdale area. He concluded a very thorough examination and said my eyes had been stricken with glaucoma. My [intraocular fluid] pressures were in the high 40s [pressure in the low teens is normal], and Dr. Rosenfeld insisted I see an ophthalmologist immediately. His suspicions were confirmed and I was started on pilocarpine eyedrops. Name: Elvy Musikka, Title: Medical Marijuana Patient in the US Food and Drug Administration (FDA) Investigational New Drug (IND) Program, Position: Pro to the question "Should marijuana be a medical option?" When I was a young man of 16 years, I had the privilege of being one of the thousands who marched on Washington D.C. and listened to the "I have a dream" speech of Martin Luther King, Jr.
Allan Erickson is the 11th most published drug reform author in the US and a 'Newshawk' for the Media Awareness Project. He is also a photographer for hire, and his writing services are available as well. There are over 30 bills in the Oregon legislature dealing with cannabis, most dealing with the Oregon Medical Marijuana Program (OMMP). (SALEM, Ore.) - Mothers Against Misuse and Abuse (MAMA) held an event at the state capitol on Monday, April 13. The all-day presentation, "The Faces of the OMMP: We're the People in Your Neighborhood" featured a display of posters and educational material, and put faces on some of Oregon's patients who utilize cannabis as medicine. Oregon has a large and dedicated (but occasionally prickly) population of cannabis/drug policy activists and organizations. MAMA sharply demonstrated that our politicians have fallen behind citizens in their understanding of the truth about cannabis. Click > here < for more. Alas, Oregon has added itself to the states suffering a lethal case of reefer madness. Hubert Henkel is dead after being shot in early March by two Clackamas County sheriff’s deputies serving a warrant for cannabis cultivation at 10:30 p.m. on his farm near Mulino. A neighbor described the 68-year-old Henkel as “the hardest working guy I’ve ever met.” His longtime companion, Marjorie Crawford, 80, was arrested. A hardworking pair of seniors is terrorized in their home, late at night, because they enjoy pot? And / Or, visit AE's blogspot, the Morning Donut, like a Café … where you can Grab your coffee and get yourself a donut. Simple musings for thoughtful folks... (or is that thoughtful musings for simple folks? hmmm...) Or, consider it... like sitting down for coffee in the kitchen. Brian Michaels is a Eugene based lawyer who specializes in criminal cases, drug crimes, search and seizure, forfeiture, the Oregon Medical Marijuana Program, and civil rights cases. He is a member of the NORML Legal Committee among other notable groups. Gathering Steam, Eugene attorney Brian Michaels challenges the constitutionality of the 34-year-old Oregon Mass Gathering Act. Lane County Circuit Judge Jack Billings swiftly denied a defense request for a new trial for a University of Oregon student convicted of disorderly conduct and resisting arrest at a downtown demonstration in Eugene, Oregon. Brian Michaels, an attorney for Ian Van Ornum, argued that Billings had improperly denied a defense request to include a special jury instruction that would have provided the six jurors additional context for evaluating whether the 19-year-old demonstrator was unlawfully resisting arrest or engaging in lawful self-defense against excessive force by police. Click >here < for more. A longtime Samaritan Health Services nurse is contesting his dismissal, claiming he was fired not because of his job performance but because he has been an outspoken advocate of medical marijuana. An executive of the health care network disputes that claim. Ed Glick was terminated April 18, 2006 from his job as a nurse at Samaritan Regional Mental Health Center in Corvallis after he refused to take a drug test. Visit - http://mercycenters.org/action/Case_Ed.html - for more. Nursing is caring. Twenty years ago I began to learn what real suffering looks and feels like. I watched helplessly while beautiful young men would, in three months time, age 50 years, dying from a disease no one knew anything about at the time. I have watched tobacco-cancer eat the lungs, livers and hearts out of people. They had no idea, when they began using this legal herb, the consequences in store for them. I’ve cared for all of these people because they were suffering, and because I am a nurse. Jennifer Valley is a member of the Board of Directors for Voter Power and Willamette Valley NORML, winner of the 2002-2003 Oregon Medical Cannabis Awards (OMCA), and organizer of Stoney Girl Gardens, home of the best 100% Organic Medicine grown in Oregon. Visit - http://gro4me.com/ for more on Stoney Girl and her Gardens. Her unique strains of marijuana will be featured in the "Big Book of Buds- Volume Four. 2007 HOUSE COMMITTEE ON ELECTIONS, ETHICS AND RULES, TAPE LOG, May 16, 2007 - Hearing Room E, 8:30 A.M. Tapes 87 – 90; Lindsey Bradshaw, Cannabis Activist, Jacksonville. 90A. 026. Chair Rosenbaum. 030 ... Jennifer Valley, Member, Willamette Valley NORML. 89B. 076. Chair ... Click > here < for more. Shawn Flury Shawn Flury was the founder of Oregon Green Cross and former drug war prisoner who served 20 months in prison for growing marijuana for sick and dying people. Oregon City, OR July 28, 2005 -- Criminal proceedings that began Wednesday will test the limits of Oregon's medical marijuana law. Clackamas County sheriff's deputies arrested Shawn Flury, 44, and David Thomas Howard, 51, more than a year ago during the raid of an Oregon Green Cross marijuana-growing operation. Both are charged with possession, manufacture and delivery of a controlled substance. PORTLAND - Sheriff's deputies have seized 110 marijuana plants from a greenhouse in Woodburn operated by a medical marijuana group. Shawn Flury of Oregon Green Cross says the crop was for about 35 people allowed to smoke marijuana under Oregon's medical marijuana law. Each person was given an ounce of the drug twice a month. However, sheriff's officials say they seized the marijuana because the operation lacked the documentation needed to grow that many plants. Click > here < for more. Oregon City -- Two medical marijuana growers, including one who told police that Jesus called him to "grow the herb" for sick people, will be sentenced today in a case that highlights ambiguities in Oregon's medical marijuana law. Shawn Flury, 44, and David Thomas Howard, 51, this month joined the ranks of growers convicted on felony drug charges for violating the state's medical marijuana law at their Clackamas County greenhouse. Barry Stull Barry Stull one of Oregon's pioneers in Cannabis Research is a long-time activist on hemp and medical cannabis issues. Many Lewis & Clark students wear hemp necklaces or bracelets. Junior Barry Joe Stull puts them to shame. He wore a 100% hemp suit to his jazz band performance last Tuesday. The next day, he wore jeans made of hemp and a tee-shirt with "hemp" emblazoned across it. He then proceeded to help distribute posters printed on hemp paper to advertise the LC Hemp Club's first event. Stull, a music and pre-law major and recipient of a Dean's Scholarship, is the coordinator and founder of the club. Jim Greig is an Organizer for Americans for Safe Access ( http://www.safeaccessnow.org/ ) and a member of the Board of Directors for Voter Power ( http://voterpower.org/ ) and Willamette Valley NORML ( http://w-v-norml.org/ ) He co-organized this year’s event. Dan Koozer is the other co-organizer of the GMM. He is the producer of the weekly TV show "Cannabis TV” and the Emerald Empire Hempfest. He is also the Chapter President of Willamette Valley NORML and will be the Master of Ceremonies for this years Global Marijuana March. We at Willamette Valley NORML would like to note that this is the result of no small amount of work by W-V-NORMLs own Jim Greig and no small amount of courage by the Mayor of Eugene, Kitty Piercy. Word of her proclamation has already circulated to the conservative elements in Eugene and we hope many of you will help her out and follow the story up with letters to the editor expressing your opinions and help her to more than just survive. Click > here < to hear an audio clip as read by Russ Belville, NORML National Outreach Coordinator and Host of the NORML Daily Audio Stash. Eugene (KMTR) – Eugene Mayor Kitty Piercy plans to speak at a rally Saturday in support of medical marijuana. And for the second time, she will be making a proclamation marking Medical Marijuana Awareness Week in her city. Mayor Piercy was asked if attending a rally for medical marijuana is the right message to send during a time of economic crisis. in the city of Eugene, and encourage all citizens to join in this observance. 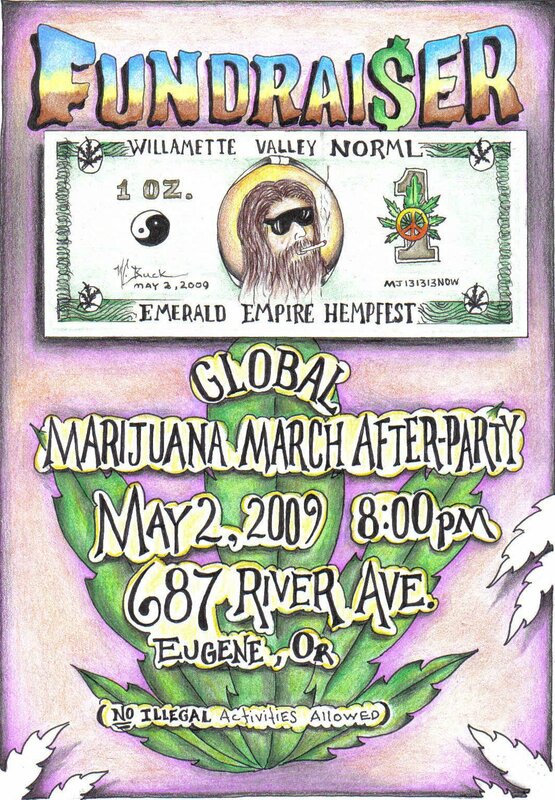 "This link - http://cateatsdog.blogspot.com/2009/05/global-marijuana-march-eugene-2009.html - for photos."